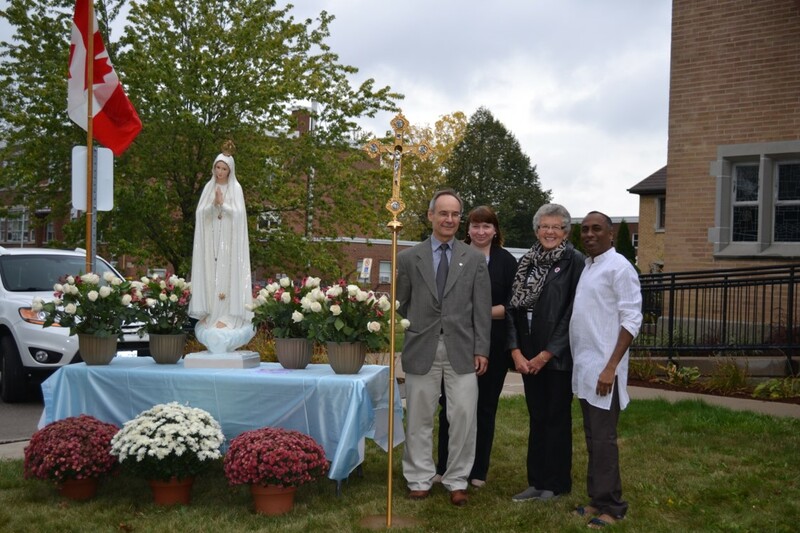 On October 14, 2017 we celebrated the 100-th Anniversary of Our Lady of Fatima Apparitions at St. Anne’s Roman Catholic Church, with the kind permission of Pastor Father Raymond Peter, the generous help of custodian Bruce, parish secretary Nellie, and with the presence of a special guest – Our Lady of Fatima, a four-foot-high beautiful statue courtesy of the Sisters of Mount Carmel Monastery in St. Agatha, Ontario. 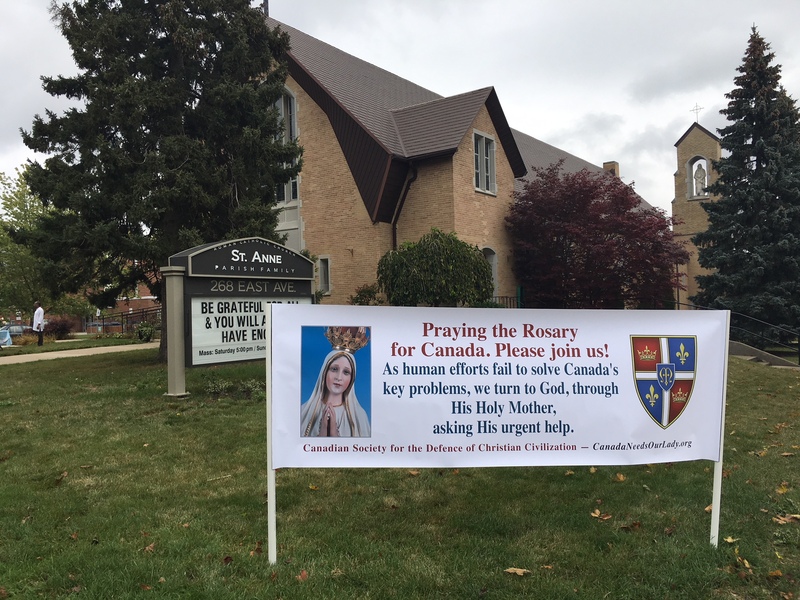 This Public Square Rosary Rally was an initiative of the Canada Needs Our Lady organization, a special campaign of the Canadian Society for the Defence of Christian Civilization, which predicted a total of 600 such rallies to be held across Canada at the same time, during this special centennial anniversary. Mary, the Mother of God appeared to the 3 shepherd children Lucia, Francisco, and Jacinta in Fatima, Portugal in 1917 – a total of six times, with the final apparition on October 13, 1917. On the same day the Miracle of the Sun also occurred to prove the authenticity of Mary’s apparitions and to strengthen people’s faiths, where the sun unnaturally began to spin in the sky and to fall towards the earth – a miraculous spectacle that was witnessed by 70,000 people. Mary’s messages to the children of prayer (especially the rosary), repentance, self-sacrifice, reparation and peace are messages that our world needs to hear today as well. This considering: widespread abortions (100,000/year in Canada alone), frightening natural disasters of apocalyptic proportions (i.e. recent hurricanes in the Caribbean and the U.S.), nuclear threats, and rampant attacks on the sanctity of marriage and families by most western governments and institutions. 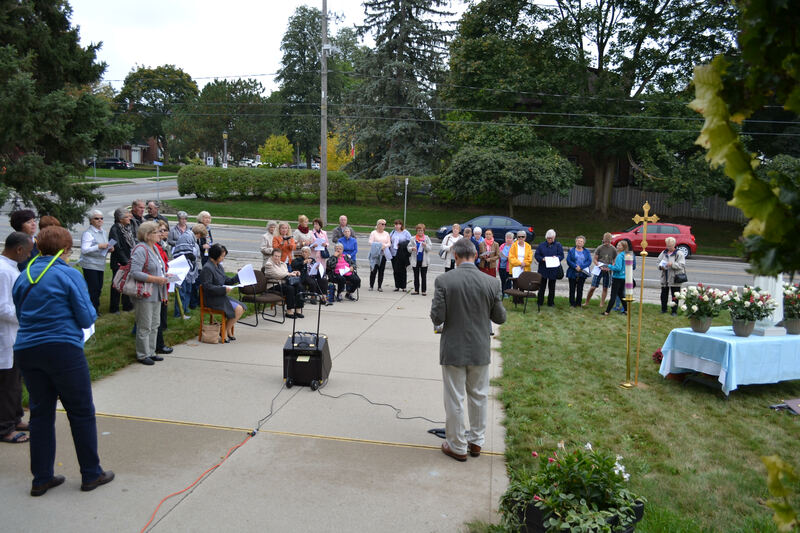 This was a celebration with various ethnic groups attending, with songs of praise and various prayers, especially the rosary, which was said in four different languages, English, Polish, Spanish and Portuguese. Afterwards a beautiful feature film about the Fatima Apparitions entitled “The 13-th Day”, was shown in the church hall, with stunning images of the visions and the final miracle, that was never before fully realized on screen. The audience also enjoyed very delicious refreshments of coffee, tea and cookies during the film, courtesy of the ladies of the parish (Doris and Pat) and delicious pastry baked by generous outside volunteers (Tina and Grace). A special thank you to everyone who contributed to make this a very special and blessed celebration of God’s message of hope for mankind, as revealed by the Blessed Virgin Mary at Fatima.